So. Spoilers. Little Amelia’s going to make an important appearance, the Doctor’s got to somehow manage to get himself back into the action, River somehow survives ‘TARDIS bang bang’. All in all, these pics aren’t that spoiler-y, but what’s reeally interesting: Is that Dalek set in stone? 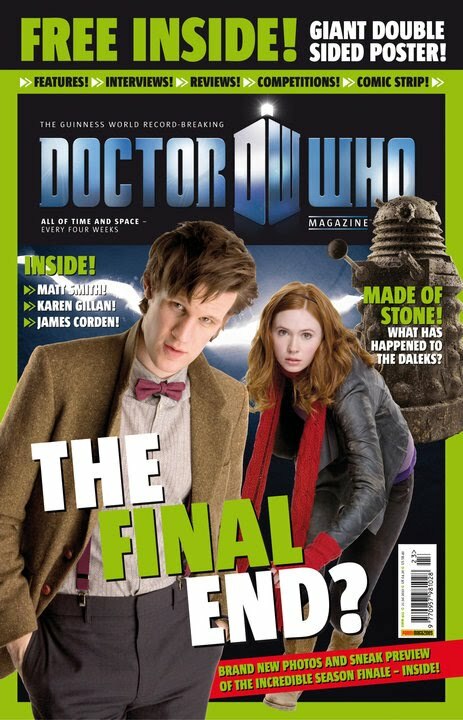 The cover of the DW Magazine suggests that that’s the case. Hm. Seeing as we’re stuck in Greek mythology already, why not bring back Medusa? The Doctor already made a bit of fun of a statue of Perseus, who had the pleasure of beheading the woman with the snake-y hair, when he visited the Musée d’Orsay together with Amy and Vincent; that might be an idea. Or.. just.. not. Anyway: my dearest fellow Whovian M. suggested that the voice whispering “Silence will fall” could be Dalek CAAN, or maybe Davros–didn’t these guys kick the bucket in Journey’s End, though? Or am I getting things confused again? In any case, I think it might be the right voice, but I can’t be sure. Anyone else here think that’s possible? Could the Daleks be pretending to be allies, but cheating everyone else on the way again? Could it all, for the fourth time in the new series, be a Dalek conspiracy? Fascinating speculations as always. One minor point… it’s actually Dalek Caan. Oh, gosh, you’re right, it’s Caan! *whacks herself in the forehead* … there, corrected it. Must’ve been late when I typed that up. No worries, it happens to the best of us. Psychotronic is an anagram for Chronic Typos. Next“Trust the Plastic!” — 2,000 Words on Doctor Who: The Big Bang. Geronimo!